​Q: What is the best way to contact Summer Music Intensive staff? A: Email us at artonthecornerbr@gmail.com or call 718-745-8520 during regular office hours (M-F, 9am-3pm; during program weeks, office hours are extended to 5:30pm). Q: What do students need to bring with them? A: Students should wear comfortable clothing and closed-toe/closed-heel shoes for movement. Students may bring a non-refrigerated, nut-free, peanut-free snack or two and a full bottle of water each day. Q: Can my child try-out the program before registering in full? A: There are no open houses, drop-ins and/or observations scheduled; however, please feel free to e-mail us at artonthecornerbr@gmail.com to arrange for a brief visit to see the space and get more information in person! Q: What's a "performance showcase?" Q: Do children have to participate in the final "Performance Showcase" if they don't want to or are not available to? A: No! We encourage all of our students to participate in the Performance Showcase; however, we believe there is also great value in participating in the program without the goal of the final performance. Students who do not wish to perform may be given other important roles, e.g., announcer, stage crew, etc., so that they will still have the opportunity to fully participate in the program. Please let us know in advance if your child will be unable to take part in the Performance Showcase, so that the faculty may plan accordingly. Q: Do you offer summer workshops for younger children? A: At this time, we don't offer classes for infants, toddlers, and students in early childhood and primary grades. If you would like us to consider doing so in the future, please let us know of your interest. Q: Do you offer a full-day option? A: At this time, we don't offer a full-day option. If you would like us to consider doing so in the future, please let us know of your interest. A: Yes, we offer a 10% discount to each sibling who registers for a Summer Music Intensive workshop. This discount cannot be applied retroactively. Please contact us at artonthecornerbr@gmail.com for more information. Q: Who teaches the workshops? A: Each of our programs is taught by highly-trained, skilled, professional music educators who are committed to providing participants with an exciting, positive and rewarding musical experience, in a structured and supportive environment, to encourage students' interests, cooperation, creativity, and talents. Q: My child has food allergies or needs medication during the day. How do you handle medical concerns? A: We ask that each family who registers a child for a Summer Music Intensive class complete a Registration Form, which includes medical information (such as food allergies/medication needs) and emergency contact information. Summer Music Intensive is a NUT-FREE program. Additionally, if a child has a food allergy or medical condition that requires special attention and medication, caregivers are asked to bring a zip lock bag with the childs name printed clearly on it with needed medication (e.g., Epi-Pen, Benedryl, inhaler) inside; clear instructions for administration of medicine; and a note detailing the type of allergy, severity of allergy, parent contact information, and Doctor contact information. A: All cancellation requests must be sent in writing to artonthecornerbr@gmail.com. Refunds requested before the workshop start date are calculated at 50% of the total workshop fee minus the non-refundable Tuition Deposit Fee [$50]. No refunds or credits are issued following the second class of each session regardless of whether further sessions are attended or not. Q: What should I do if my child cannot attend a class session? A: Please let us know ahead of time so we can prepare for absences by calling 718-745-8520 or emailing us at artonthecornerbr@gmail.com. Due to the structure of our programming, we are unable to offer make-up classes or credit for any missed sessions. Please note: regular attendance and participation is vital to accomplishing the goals of our collaborative, ensemble based-program. Students who miss more than 1 day of the week-long workshop may not be able to fully participate in the performance showcase at the end of the program. Q: What happens if there is inclement weather? How do I find out if classes are cancelled or when/if the make-up date is? A: If there is inclement weather, Summer Music Intensive will follow the advice of the NYC Emergency Management / Office of the Mayor / Department of Education regarding the canceling of school-type programs. If we need to cancel, you will find an outgoing message at 718-745-8520. In addition you will receive an email at the address you provided during registration and an announcement on Art on the Corner's website and Facebook page. We will attempt to reschedule missed classes; however, in the face of inclement weather and carefully scheduled workshops, we may not always be able to offer a make-up date. Q: Can I sit in the class and watch? A: Summer Music Intensive maintains a closed-class policy. We believe that our closed-class format best supports your child's development of self-expression, creativity, self-confidence and independence. Closed-class time allows participants to focus without interruption making the workshop environment conducive to a cooperative, educational experience. During class time, if preferred, caregivers are welcome to wait on the veranda outside the church offices rather than drop-off students and return promptly at the designated dismissal time. Q: What should I do if I am unable to come to pick-up my child at the designated dismissal time? A: Out of respect to Summer Music Intensive's faculty and staff, we ask that arrangements be made to have students picked up promptly at the designated dissmissal time. Parents may indicate any additional individuals who are approved to pick-up their child on that student's Registration Form. Parents may also sign-off on the Registration Form if they wish to give students in grades 4 or higher permission to leave Summer Music Intensive on their own. Students in grades 3 and under must be met by a parent, guardian or other designated caregiver. If an emergency has kept you from picking-up your child at the designated dismissal time, please let Summer Music Intensive staff know by calling 718-745-8520. 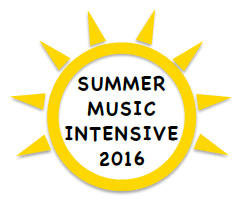 Summer Music Intensive reserves the right to charge late fees. Please contact the us at artonthecornerbr@gmail.com for more information regarding our Late Fee policy. ​Q: I would like to report Summer Music Intensive as childcare on my taxes. What is your TAX-ID number? A: Please report it as Art on the Corner, Lutheran Church of the Good Shepherd, 11-1635100. Registrations are accepted on a first-come, first-served basis for all programs. Full payment and completed forms are required to be considered 'registered' for the program. All forms and payments must be received by June 30, 2016. A non-refundable $50 tuition deposit reserves a place in the designated workshop for your child.​ A separate registration agreement is required for each individual student. A 10% sibling discount is available. Payment is accepted by cash, by check made payable to ART ON THE CORNER, or via PayPal on the artonthecorner.org website. You do not need a PayPal account to make a payment online. Please note: When making payments online, a small processing fee is added. All transactions appear as “English Evangelical Lutheran Church of the Good Shepherd. A $25 fee will be charged for returned checks. The fee and replacement payment must be paid by money order. There are no make-up sessions for absences. No refunds or credits are issued following the second class of each session regardless of whether further sessions are attended or not. Refunds requested before the workshop start date are calculated at 50% of the total workshop fee minus the non-refundable Tuition Deposit Fee [$50]. All cancellation requests must be sent in writing to artonthecornerbr@gmail.com. ART ON THE CORNER/SUMMER MUSIC INTENSIVE reserves the right to cancel any program that does not meet enrollment requirements. Summer Music Intensive has a zero tolerance policy for any child or parent behavior that threatens the welfare of the children involved in our program. Summer Music Intensive staff will try to work with any family to determine a fair resolution; however, we reserve the right to take disciplinary actions, which could include expulsion from Summer Music Intensive programs without warning or refund, towards any adult or child who repeatedly disregards Summer Music Intensive's stated policies or otherwise engages in actions deemed inappropriate by Summer Music Intensive staff.